I fell asleep last night thinking about my great-great grandfather James Price, who is now stuck in my head as Big Jim. He was the third of six children from a town where no one ever went anywhere, yet he turned his back on the family business and struck out on his own at a young age. I was trying to put together a Price-Newham family tree, including all the siblings and cousins I've been able to identify, from the generations who lived in England. It got me thinking again about those who stay home and those who get up and go. This is the way with history -- as soon as you think you have a what, it turns into a why. The Prices were carpenters from the civil parish of Mathon, tucked in the southwest corner of Worcestershire. The big landowner appears to have been the Church of England (the Dean and Chapter of Westminster Abbey). There was no question of the Prices owning any land, so inheritance wasn't an issue. But they did have a shop in the village, next to the school. Jim's younger brother Philip became a master carpenter there. 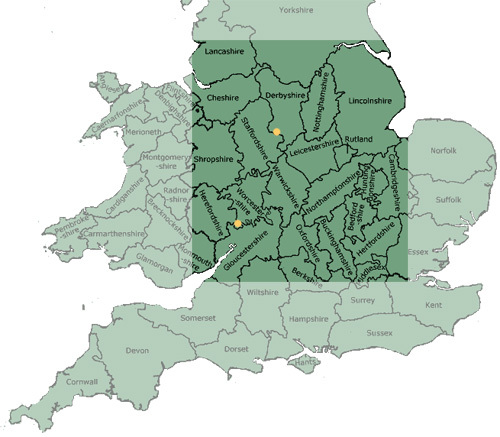 But Jim took off for parts north, settling in the Sudbury area, on the border between Staffordshire and Derbyshire. There is some hint he may have left home to work in coal mines -- though it's hard to imagine that would be considered a step up from carpentry. Maybe he just wasn't suited for the detail work of making wheels and windows. Although (by 1881) his son Bill took up carpentry, Jim remained a laborer throughout his life. Queen Victoria was in the early years of her reign and the Industrial Revolution was in full swing. Due to bad harvests and sluggish markets, the decade was known as the "Hungry Forties." And their bones are just ready to start through their skin. We shall eat one another instead of roast beef. Friedrich Engels was beginning to write about the plight of the working class and Charles Dickens was popularizing it. Parliament was beginning to debate the role of government in regulating work conditions (like child labor) and dealing with the poor. The conditions in coal mines were horrific, with all manner of ugliness taking place among the men, women, and children who worked in them. No wonder Jim didn't care to make a career of it. I sense Jim left home because he could envision a better life for himself. Jim and his wife Ann moved around the Sudbury area following the work. They may have been poor all their lives but still knew that something better must lie ahead. They were probably pleased when their only surviving son Bill married into the Newham family and -- even though it left them alone in their old age -- I bet they encouraged Bill and Sarah to find their fortune in America. *Cider and perry: beverages of about 5.6% alcohol by volume. And yes, they were from the part of Worcestershire where Lord Sandys commissioned the concoction of Worcestershire sauce.